While entering into the world of GUI Extension programming I have found it is another world where we need new tools and approaches to supplement our classic web development view. For me it was an entirely different way of working, something I am still getting used to. Today I discovered 2 things that I hope will help you get more comfortable in the new Tridion 2011 GUI Extension world. 5. Use the search box (top-right of Dev Tools) to find some text from your _execute method in the js GUI Extension code. For me it starts at around line 85702. 7. Refresh the GUI, hit the button for your extension, and the breakpoint will be highlighted in the bottom debug window. 8. On the right side of the debug window are the Watch Expressions, Call Stack, Scope Variables, etc. I prefer to minimize Call Stack and expand Scope Variables. 9. Step through the code by using the down-arrow on the right side. Have no fear, the Chrome debugger is here! Go to Console, see the red X with the error, click on the link on the right side with the Dashboard filename. Your breaking error is shown. Also, if you are using Jaime’s example, comment out the message center code because in Tridion 2011 SP1 there are changes in the message center that are not compatible with this code. Update: You will also see this view if any file paths in the <cfg:fileset> of your GUI Extension cannot be found!
. Get this in sync and you can again enjoy the full splendor of Tridion 2011. Tridion provides excellent versioning on many items, including Components, Pages, Keywords and Templates. This weeks bUtil is bRollback, giving the ability to rollback an item and its’ Blueprint children to the previous version. This is very handy when you update Components via an external script and then realize there was a mistake and want to rollback that Component. The script operates on a Component, but can easily be modified to work on a Folder. Also, sometimes the editor updates 1 item and all of its’ localized copies but then needs to rollback 1 version because the business has changed their minds or the deadline is postponed. This might also happen with translations if there was a mistake in the original source content going out and only notice it later and need to rollback 1 version. The Tridion GUI allows us to rollback versioned items using the context menu, select Versioning, History and all the previous versions of the item appear. When we rollback to a previous version and have 2 options – first to select to make a copy of the previous version and save it as the new version (safest) or to go back to that version and remove all versions after it (losing all changes after the rollback-to version). We can also compare our current version to a previous version from this screen. This takes about 2 minutes per item – with 30 localized items it would take around 1 hour to rollback all of them to the previous version. The Tridion API provides an easy way for us to access the versions of an items and to rollback to a previous version. I created an ASP Custom Page to do just this – rollback an item, and all of its’ localized items, to the previsou version, or in other words, current version – 1. There is also a ModifiedDate checkbox that will only show the last modified date and not rollback anytrhing. My assumption is that most of the time you use this tool the items are updated via a script or an author AND around the same time. I would not want to run the rollback tool if some items were updated much more recently than what I expected. The script itself is a take on my 2 previous scripts, BCopy and BDelete. These are Blueprint-aware Custom Pages where the action starts on the Blueprint parent and also takes effect on the Blueprint child. Currently the only action in the GUI that provides this type of functionality is the Publish action, where we can choose to publish child items. The script uses the safe option creates a new version. The Blueprinting feature of Tridion is really great and keeps all of our items ‘connected’ to the parent – and won’t let us delete an item if it has localized children. This is a problem when we want to clean up our system and remove old items – or if you’ve been using bCopy and accidentally copied an item you didn’t want to. BDelete is the inverse of BCopy – UnLocalizing all children and then after this deleting the parent. 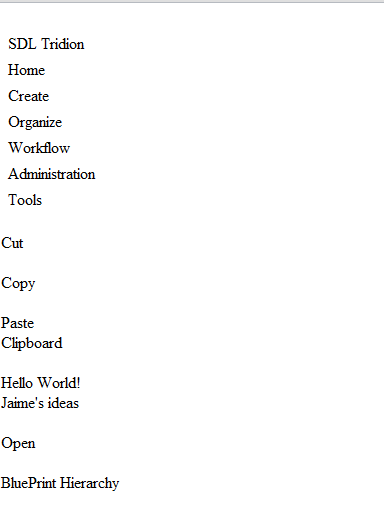 This script does this for Components, Pages, Structure Groups, or Folders. Delete Page: Pages need to be unpublished first. The tool does not unpublish pages. Delete Component: Components need to be removed from Pages, removed from Component Link fields in other Components, and unpublished. The tool does not do this and it will fail. Delete Folder: Will work every time, no dependencies. Delete Structure Group: Will work every time, no dependencies. Tridion provides great Blueprint functionality allowing us to share and localize content across many locales and Publications. Sometimes we want to make a copy of an item – the whole item with all of its’ Blueprint-children, and then maybe change some metadata with the new item and nothing else. 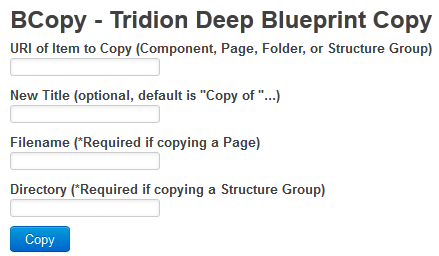 However, the copy button in Tridion only copies the current item – and not its’ associated Blueprint-children. Tridion BCopy copies the item (Component, Page, Structure Group, or Folder) and all of its’ Blueprint-children, including associated metadata, etc. When copying a Folder or Structure Group it does not copy the contents of it – only the item itself. 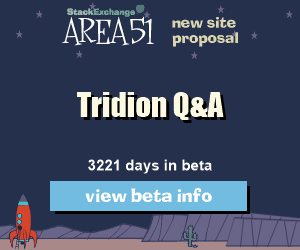 The code is written in classic ASP – yes, I hear you moaning or cheering, but rest assured this approach works on all versions of Tridion up to Tridion 2011 and is quick to deploy and start using right away. I tested the code on Tridion version 5.3 and it works great. The most interesting part of the code is getting the localized items. This approach uses the GetListUsingItems and a special RowFilter condition. You might want to use the same code to process localized items for updates, etc, and I have used it many times. We use the GetXML method to get the contents of the item. When updating, we use the UpdateXml method of an item to save the original contents to the copy. This is the best and fastest way to update Tridion content. I use Twitter Bootstrap version 1.0 for all custom pages. If you have not checked this out – you need to. No need to write your own CSS for custom pages anymore! Use the Bootstrap HTML / CSS and have nice looking custom pages in no time. View the full code on GitHub at TridionBCopy or download the zip. Copy to the Tridion/Web/CustomPages folder on your server or wherever you put your asp custom pages. Create a link to it in the Custom Pages tree menu and save time with it! Tridion 2011 provides some obvious benefits and many hidden benefits for upgrading from 2009 to 2011. Overall it feels faster and for a very good reason- Tridion R&D has upgraded every architecture piece in the puzzle – taking us from 2008 to 2011 in 1 upgrade. For example, we now have .NET 4.0, WCF, OData, NHibernate, Logback, Java 6, and Razor. 1. World Server connector – If your organization uses SDL World Server for translations then the new SDL Tridion connector is for you. Simply send the item for translation and it gets translated and automatically updated back in Tridion, triggering a possible workflow, and removing 90% of the effort of translations. It works similar to previous SDL connectors such as SVN or Perforce. 2. Faster and Cross-platform GUI – Better tree controls, faster GUI, and a thousand other small GUI improvements that make using Tridion 2011 a much better experience. Use Chrome, Firefox, Safari, or IE to access the GUI. The faster the js engine, the faster Tridion will respond. Also supports Mac! 3. GUI Extensions – Easier to extend and customize the GUI to improve the Editors use of Tridion. Create new tabs on a Component Edit screen, add a new column to the main list view, add a button to the toolbar or even a whole new tab in the toolbar. Anything is possible in the new Anguilla GUI framework – and it is all supported by SDL Tridion. 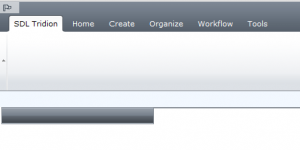 Many blog posts are written about creating a GUI extension. 5. Razor Template Mediator – Not available in 2009 because it uses Microsoft’s Razor engine, only available with .NET 4.0. Download the Razor Mediator and experience the power of .NET with the simplicity of VBScript. A major advantage when upgrading VBScript templates. 6. Re-invented Event System – The Event System is rewritten from ground up. Now it is possible to fire events asynchronously, during 5 phases (instead of 2), and be written in .NET 4.0. Overall a huge improvement. See my article about creating a first 2011 Event System. 7. Solr Search Engine – Verity is out and Solr is in. Solr is an open-source, http-based, faceted search engine from the Apache project that is much faster and handles large indexes much better. XML.com has an intro as well as IBM having a tutorial. 8. New Business Connector (aka Core Service) – A WCF 3.5 Web Service called the Core Service can be used to access Tridion objects from any SOAP client. An excellent article by Bart Koopman provides some insight into the new architecture. 9. OData Web Service – Content delivery gets a new OData web service that can be used by external data consumers for querying the Broker database. Ryan Durkin has a nice post walking through creating an OData client. 10. Better multimedia publishing – Choose to store multimedia files in different storage places. Julian has a great article explaining how to do this. Do you have another benefit for upgrading? Tridion 2011 provides us with a WCF 3.5 Web Service named the “Core Service”. Previous versions shipped with the Business Connector, a SOAP-enabled webservice that accepts XML to perform actions in the GUI. However, if we want a simple RESTful web service to call from jQuery or .NET in any version of Tridion we need to roll it ourselves. In this article I want to demonstrate how to create a web service using the ServiceStack framework, jQuery, and Tridion. Of course, I have to admit that this is the first step in my ultimate goal of having a GUI-based content porter – a ‘smart porter’ if you will, that will send a POST request to another CMS with Component XML and create the new item, but if the linked items are not available, it will call back to the original CMS, get the linked items, and continue. The example here proves it is not that difficult and with jsonp we can make cross-domain calls to various CMS servers – something that was not available at the time when Content Porter was created. In my current project we have 1 Dev server, multiple test servers, 1 Pre-Production and 1 Production server. All needing good content – specifically web application content in the form of string key/value pairs. For new strings we would like our Production Content editors to create the content once, and only create it from 1 custom page in Production for all systems. I want to create a jQuery friendly web service that could give me the ability to talk to the Tridion API on multiple CMS servers from 1 custom page on the Production CMS. Behind the scenes we use jQuery jsonp to do a post of the form contents to each CMS. Also, we don’t want to have to content port each new string resource to all environments, since this incurs an extra manual task. After searching for a simple and clean way to setup a web service in .Net, reading numerous WCF tutorials and not feeling convinced it was what I needed, I was relieved to find ServiceStack. It is a great alternative to a WCF Web Service. I am working on Tridion version 5.3 and using Visual Studio 2010 SP1 ASP.NET MVC 3, but this code works on all Tridion versions. In a future article I will explain how we can solve the same scenario using the CoreService of 2011. Create a new MVC 3 Web app. Use Web Platform Installer (WebPI) if you do not have it. It is also possible to host a ServiceStack web service with a Console app and also a Windows Service. NuGet is a package manager for Visual Studio and is awesome. It saves about 10-15 minutes per external assembly you might want to use. It is also the quickest way to get started with ServiceStack. Re-open Visual Studio and right-click on the solution and select Manage NuGet Packages, select ‘Online’ in the left, then search for ServiceStack, and select ServiceStack.Host.Mvc. It will add references and a lot of items in the project. 1. Update global.asax with the ignore for /api route and the favicon.ico file. 3. App_Start/ServiceStackFramework.cs – All the magic is here. In fact, EVERYTHING in the example is here, the model, services, etc. I like to split these into separate .cs files to make it more clear, and we’ll do that later in the code. For now, notice the DTO class contains the properties we are serializing back to the web form. Right-click the Services folder, select add class, and add KeyValuePairService.cs. The class needs to implement the RestServiceBase to be able to respond to service requests and the Type is our POCO created earlier. This is very important as it is the ‘glue’ to connect our service to our model. No config needed! It is a good idea to follow the repository pattern and put our code in the Repository class we will create next to perform the actual work we are going to do instead of putting the code here in the service class. Note that the code will not compile yet since we do not have our Repository object. We will not implement the Delete action and for now I return null. Add a new class to the Repositories folder and call it ‘KeyValuePairRepository.cs’. We need to add References to the Tridion DLLs, Tridion.ContentManager.Interop.cm_defines.dll and Tridion.ContentManager.Interop.cm_tom.dll, located in Tridion CMS server at /Tridion/Bin/Client/PIA folder. Logging is needed – so I will use NuGet to grab the log4net package and then updating my web.config with the log4net config. We also need to update the Global.asax with the log4net configuration call. Now, our Post and Get methods in our new Service class are wired up. Notice the /api/ is not in the beginning of our route, but we will see later we must use it when calling our service. Add a new HTML page to the Solution. Right-click the Project, select New Item, Web type, HTML Page. Name it AddKeyValuePair. The important part is the form tag – notice the method is ‘post’ and the action starts with ‘api’. This is very important as it tells MVC not to process the request with normal MVC routing. Remember the first step of adding the ignores to the api path in Global.asax? This is a very easy to miss and important to get right, otherwise you will get errors. Each text field uses the name attribute the specify the Class property it maps the form to in the .NET class, and if not the same, the web service will have a value of null for the property. Set the AddKeyValuePair.html page as the Start page by right-clicking on it and select ‘Set as Start Page’. Run the solution by hitting F5. Fill out the form, hit the save button, and you should hit the breakpoint. Continue and you will get the default ServiceStack return page. If you inspect the keyValuePair object you should see the properties populated. Pretty cool, right? Before we get into the Tridion API things, let’s test the Get method. Create an HTML page like in the previous step, name it GetKeyValuePair.html, and paste the following HTML. Yeah! We have successfully created our web service and tested that our new URI endpoints are working. Step 7. Test the Get Method – Let’s call our web service with jQuery instead of an HTML post / get. It is a real pleasure working with ServiceStack and the Tridion API together. It feels right – little config, separation of concerns, future-proof, and full of possibilities. I hope this article gave you some ideas and you can go further by creating your own web services and calling them from a web form, .NET Event System class, or even a PowerShell script. Enjoy! Tridion provides great WebDAV functionality to browse and add items to Tridion. I use this to bulk upload images to Tridion. The unfortunate thing is the WebDAV protocol is very quirky and the client is implemented differently per OS. One trick I use is to open the WebDAV url with Microsoft Office Word. 4. Type your credentials and smile. You’re connected to the CMS via WebDAV. 5. I usually go back to Windows Explorer, copy a bunch of images, and then in Word paste them. Tridion makes all items available using a WebDav URL. This is an environment independent variable that never changes. It is preferred to use this instead of an item URI when programming templates or scripts. This WebDavURL can be used anyplace you would normally use a URI. The WebDavURL is also available on the info tab – however, on that screen you cannot copy it. The Tridion 2009 upgrade is a low-risk upgrade that provides significant benefits for templating development, tagging content with keywords, and more efficient Broker queries. Anyone using Tridion 5.3 today can gain many benefits with little effort. Read the manual. Login to www.sdltridionworld.com and download the Tridion 2009 Upgrade guide. Pay attention to the supported platforms information and confirm your servers meet the minimum requirements. Software: Visual Studio 2008 / 2010 – I prefer VS 2010 with features such as intellisense (matching a word anywhere the function contains it, not just at the beginning), jQuery debugging, and great Asp.net MVC support. It also supports compiling to asp.net 2.0, 3.5, and 4.0. Hardware – If running Visual Studio 2010 then 2GB Ram is essential. For Event System development and workflow I suggest to run a local instance of Tridion inside a VMWare image. This works really well on Macs too! Otherwise, it might be possible to remote into a development server, but sharing connections is less than ideal in a development team, and installing workstation tools on a server is not ideal. 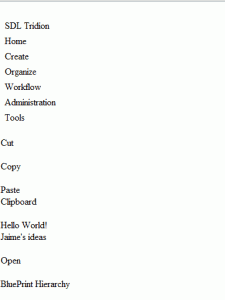 Templates– Will my existing .NET, VBScript, and XSLT templates work? Yes, Tridion is notoriously good about supporting legacy methods (there are still some version 4.4 methods in the API!). No worries here. Compound Templates– Do I need to re-write my templates? No, all 5.3 templates will work, and you can use the new Compound Templating features side-by-side with the older VBScript templates. Template Functions: What are template functions? Tridion 2009 provides the ability to write custom functions in .NET and call them from your HTML DWT templates. This brings a lot of possibilities to DWT templates. Broker– Will my Broker queries still run? The answer is yes, and they may even be improved due to refactoring of the SQL generated to the Broker. SiteEdit– Which version of SiteEdit does Tridion 2009 work with? Do I need to upgrade to SiteEdit 2009? Tridion 2009 works with SiteEdit 1.3 as well as SiteEdit 2009. Please make sure to get all the hotfixes for SiteEdit 1.3. However, SiteEdit 2009 SP2 provides great customization features, including adding items to the toolbar. It also works with both VBScript templates and Compound Templates. New browser support is added and editing pages in Chrome and Firefox never felt better. SiteEdit 2009 SP2 is definitely worth the upgrade. GUI– Will my Tridion users be OK with the new GUI? Yes, the GUI now offers more options for keywords, but otherwise the other features work as they do in 5.3. Outbound Email– Is Outbound Email compatible? Yes, and there is a new version of Outbound Email, Outbound Email 2009, that provides better email campaign and contacts management and continues to promote content re-use for all mailings. Part 2 will cover upgrading the CMS, Database, and Broker. Part 3 will cover the first steps in working with Compound Templating.